F3 Marina will open its second automated drystack facility in Fort Lauderdale in Spring 2020. In November 2018, Founders 3 (F3), a commercial real estate company based in Milwaukee, Wisconsin, purchased the former SunDance Marine facility located on SE 16th Street for $7 million. 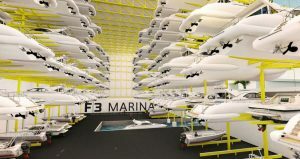 F3 Marina President John Matheson said the location was a primary draw for the company. “We are filling a need for a market that needs a good quality drystack facility that can handle larger boats. 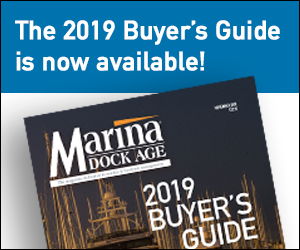 This is the best location for a drystack facility in South Florida.” F3 Marina also operates The Port Marina on SE 17th Street, which is private and not open to the public. Construction of the new facility will take 12 to 14 months, but Matheson said they are already receiving slip reservations. The marina has direct access to the Intercoastal Waterway and is approximately 1.2 miles from the Atlantic Ocean. The building will be six levels high and include 240 boat slips. The slips can accommodate boats up to 17 feet high, 46 feet long and up to a 13 ½-foot beam. The wet well in the center of the building will house two boatlifts. A computerized system will retrieve a boat from the racks, place it in the water, and then return the boat to the stacks when boaters have docked at the end of the day. The lift will be able to store or retrieve a boat in less than five minutes. “We have taken the technology and improved it,” Matheson said. The building will be constructed to sustain hurricane winds up to 140 miles an hour and will be equipped with a generator for back up during power outages. Matheson said many boaters live outside the market, and it is reassuring for them to be able to put their boat in a facility and not worry about it. The fully automated system provides storage for large boats on all six levels, whereas traditional drystack facilities are limited to putting larger boats only on lower levels due to the weight. In a market such as Fort Lauderdale being able to accommodate large boats is an advantage. Matheson also said the automated facility is an efficient use of the land. “It’s a very tight site and it allows us to store more boats in a smaller footprint,” he said. The property includes 17 wet slips in the canal for staging. A boater can call the office to let the staff know their arrival time, and the boat will be ready and waiting in the slip when they arrive. Upon return, the boat will be brought into the facility, rinsed and the engines flushed before being stored. “It’s a pretty impressive system,” Matheson said. The facility will featue a boater’s lounge and reception area, covered parking, and lockers where boaters can store their supplies. 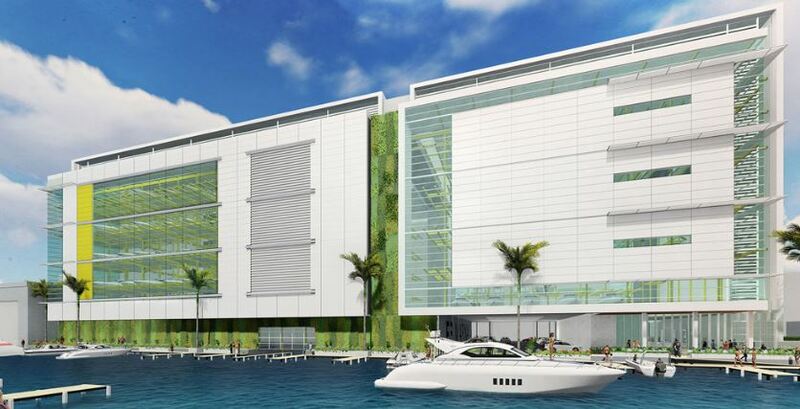 Jason Spalding of CBRE Marina Services in Fort Lauderdale said the development of the F3 property coincides with a number of new and redevelopment marine-related projects underway in the immediate area. “Given the city’s location in the heart of the South Florida market, as well as the robust marine industry here, I believe the automated facility will have a substantial amount of success,” Spaling said. CBRE Marina Services represented the seller of the property and sourced F3 Marina as the buyer. increased net operating income versus what a traditional dry stack would generate on the same property. “If the automation trend catches on and continues, I foresee a high likelihood that some of the dated, older traditional dry stack facilities will be acquired and redeveloped into automated facilities,” Spalding said.